Sometimes things catch up on me when I least expect it – But with a little reset I will rise again. Somedays still leave me absolutely drained. I can feel so completely washed out that the stairs in my house feel like they’ve become vertical. To hold my head on my shoulders is too much effort and I need to rest. If I ignore the I signs I often can’t hold a simple conversation without it seeming like I’m on meds, slurry or forgetting a word. Even a fright or shock reaction can bring this on. A constant background noise, or constant creeking door taking my attention away from what I’m focusing on. It’s usually not the events from today which bring this on, more often than not it’s what has happened a day or two previously, so sometimes I can’t put my finger on the event which caused it. I’ve learnt the hard way that when I feel this coming on to listen to it, to remove myself from the situation and “unplug” for a while. Pushing through is not an option. Energy zappers or people who expect me to hang on to​ every word I find very challenging, it really tires my brain. So I step back and let them do thier thing. To be honest, and somewhat amusingly, I’ve noticed that these types of people don’t actually notice when I’ve switched off from the conversation. Also, changes in weather conditions​. The changing spring weather we are experiencing just now I find very challenging. Warm and dry, then windy, cold and damp. It’s difficult for my body to balance itself when the weather is like this. It can show as joint aches, heavy and tight muscles, headaches or just a general malaise that sleep won’t cure. Little reminders that although most the time I can keep up the pace of life happening around me, CFS is still lurking in the background waiting to zap my reserves. Today’s bleugh has come about through my own actions. I’d been struggling through the muscle tensions and joint aches for a couple of months now and decided to give myself a treatment with my new pulseroller. Now don’t get me wrong, this tool is a massive aid, i can give myself a deep massage and get right to the deep held tensions, however the downside is that the huge release from the tensions I had been holding in my body means I can have a bad reaction​. So today I have no tightness in my muscles, I feel my muscles have let go tonnes, the back of my body in particular, however the malaise effect kicked in. Id forgot​ten and wasn’t expect it. I had to remind myself, this is not a time for me to push through, or press on. Doing so can be detrimental for someone with Chronic Fatigue. We need space, time to reset, to completely switch off my thoughts. To rest and recharge. When I say recharge, I don’t mean a cat nap on the sofa or five minutes with a cuppa. I don’t even need to close my eyes. I just need to be left alone. No talking​, no expectations from the family on my time, no thinking. I’ve only recently​ started to not feel guilty about taking time out. I used to feel it was selfish and that I was letting others down. When in reality​, I am only letting myself down by not accepting it for what it is. So take time for yourself. Teach your close friends and family to recognise the symptoms when it coming on. And if they are oblivious to your condition, wall away. Go to your retreat place. Recharge​ your batteries. Don’t feel guilty of you didn’t get dinner out in time, or if you needed help with the dishes. Ask to be left alone for an hour if this is what you need, your health and healing take first place. 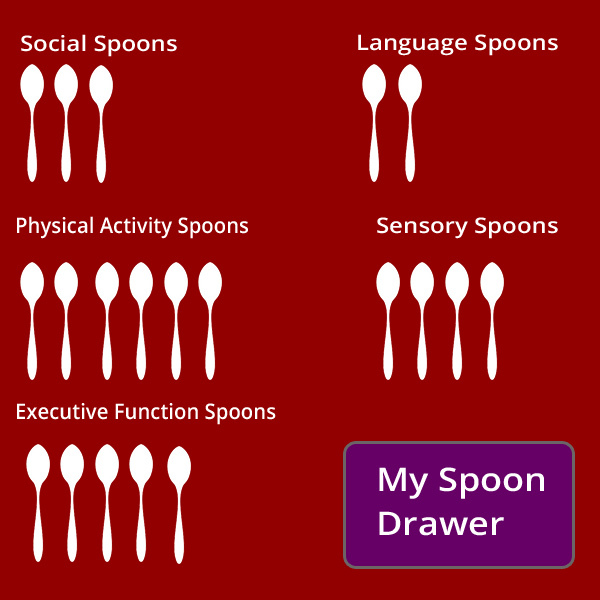 This is where The Spoon Theory makes sense to those which chronic conditions. It’s all too easy to give away our spoons, but replacing even one spoon is not so simple. Spoon conservation, you need to make a choice. Do you loose all your spoons, or do you learn walk away, to say no, not today thank you. Often our decision can surprise another, but we have to look after number one! 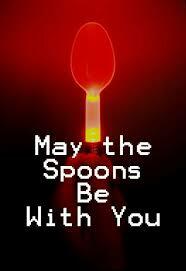 You only have so many spoons each day you waken. Today is one of those days. Don’t use up all your spoons too soon, always make sure and have two or three in the back of the dresser, you may just need one to get you back home.